Thats an awesome drawing! I’m envious of your color use! I have never been able to use color in my drawings personally. Thanks a lot! Mostly just (A LOT) of trial and error before something looks good lol. Love your blog and poetry by the way! I actually saw a cool idea on here once – someone bought a coloring book and used that as practice. Seemed like a good way of practicing without “ruining” pictures. And thank you so much! I sure hope so :) lovely work! Your giraffe’s the expressions are lovingly rendered! You have a good sense of facial expression reduced to very simple strokes. 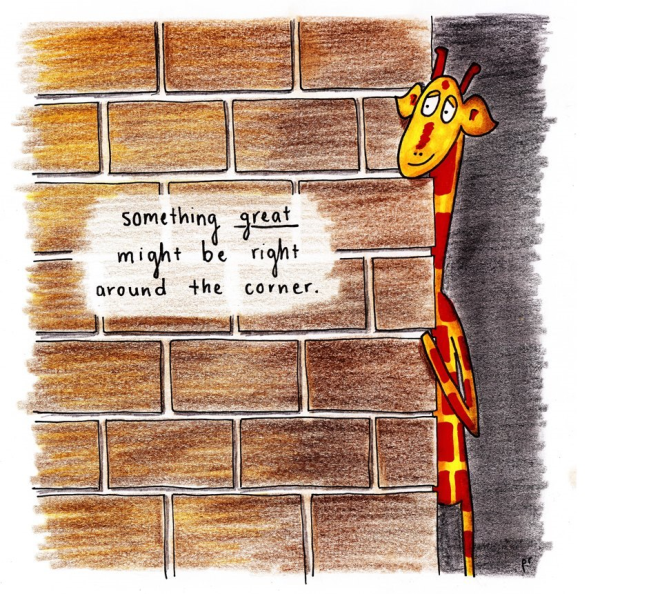 If you keep these up you’re going to have to start a Kickstarter campaign to sell a devotion book full of uplifting Motivating Giraffe comics. If you do I just might have to buy one. There will be for sure, IF you make it so…. totally true. i also needed that today. Love this! Looking forward to following your future posts Penny! I keep hoping but then the train is coming!!! I love all these giraffe Illustrations! they are so sweet and cute! Thank you! I am thoroughly enjoying your entries as well! They are so cute! ahh this is my husbands favourite! These are so sweet. Great little motivators!